Recently I teamed up with Microplane who asked me to produce a recipe that incorporates their various products into a recipe fit for the season ahead. Before I get to that recipe let me tell you a little more about Microplane. First off they produce a wide variety of graters that have the sharpest, superior, photo-etched blades out there on the market today! This makes it so easy as you can grate with minimal effort and allows all sorts of ingredients to be precisely cut which also enhances the taste as the natural aromas unfold. In fact Microplane has over 50 years’ experience with photo-etching technology. I found that during the prepping part of this recipe, as well as a number of others I’ve produced since receiving their products, that they are far-superior to anything else out there on the market. 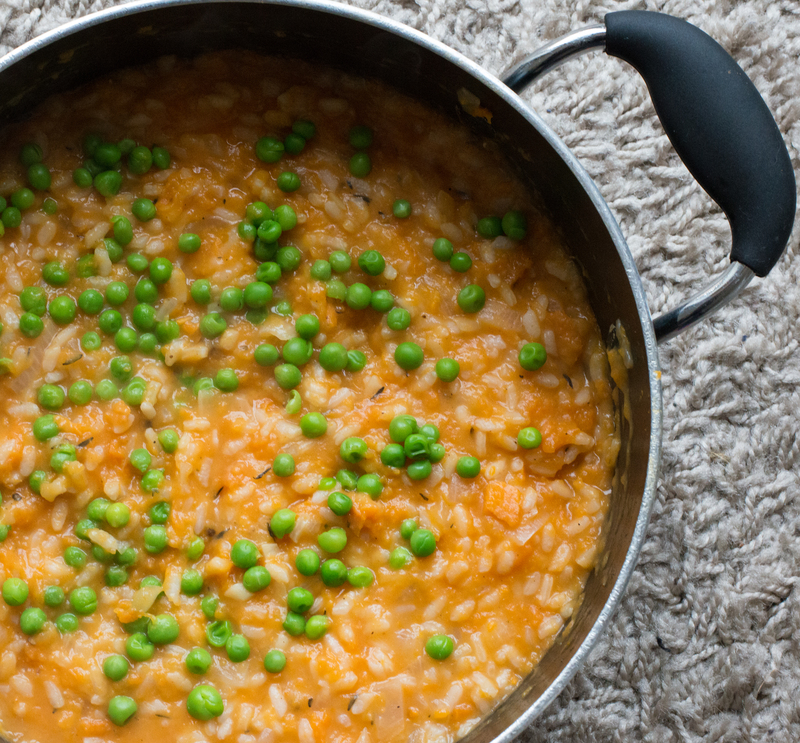 I wanted to combine comfort for this time of year with something fresh, as well as something easy to produce, and with this Sweet Potato & Thyme Risotto I believe I’ve achieved just that! The recipe is very straightforward, just make sure you stir the rice regularly to avoid it sticking to the base of the pan. I’ve also added peas for extra sweetness however you could also use sweetcorn or other small veggies instead of or as well as. Overall the recipe combines sweetness with delicious flavour and it’s a really comforting dish to enjoy as the nights draw in! Before I leave you today Microplane and I have created a competition to give away some of their sharpest graters to you. All you have to do is follow Microplane via Twitter and reply to my Microplane Competition tweet with your favourite Autumn recipe. I’ll then pick a winner and Microplane will send the prize directly to you! Anyway enjoy the recipe and make sure to enter the competition! Pre-heat the oven to 220C (conventional) or 200C (fan-assisted). On a large enough roasting tray add the sweet potato chunks, olive oil, thyme leaves and a good amount of seasoning then place into the oven for 20 minutes, turning halfway. Meanwhile heat a casserole dish on a medium heat and add the salted butter. Once the butter had melted add the onions and fry for 5 minutes or until softened, then add the grated garlic and the ground nutmeg and fry for a further 5 minutes. Next add the rice and mix well so that all of the butter has been fully absorbed. Increase the heat to high and add the white wine. Allow the alcohol to cook off and add the vegetable stock once the wine has reduced by half. Reduce the heat to medium and gently simmer for around 25-30 minutes, stirring the mixture regularly and topping up with additional hot water or stock if necessary. With 10 minutes left on the risotto, remove the roasted sweet potatoes and transfer them to a large enough saucepan. Add the milk, butter and some salt then mash well until the mixture is smooth. 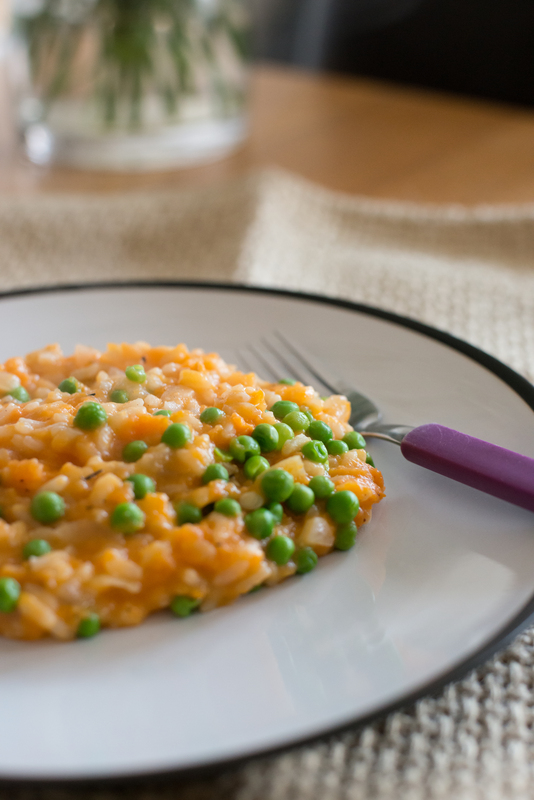 Transfer the sweet potato mash to the risotto once the rice is fully cooked and mix well. Finally add the garden peas and cheddar, cook for a few more minutes then serve. Disclaimer – this is a sponsored post and a commission was received for writing and publishing the recipe and content.